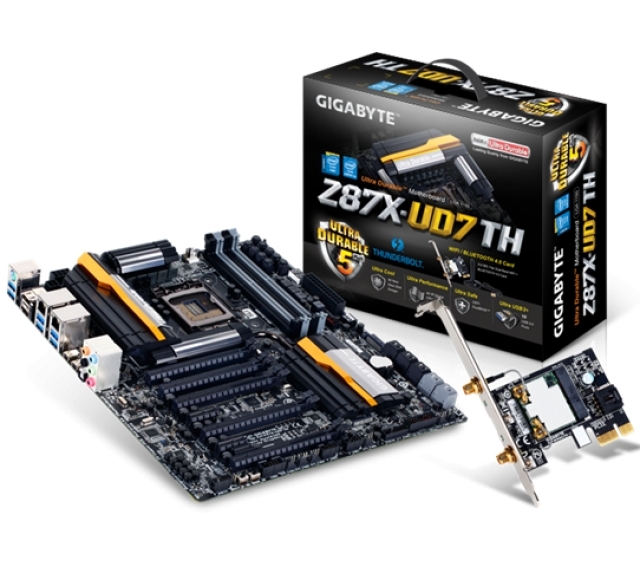 Gigabyte decided to fulfil increasing demands for higher data transfer speed and today announed official certification of Dual Port Thunderbolt 2 technology which will be implemented in their GIGABYTE Z87X-UD7 TH model motherboard. This technology will allow speeds of up to 20 Gb/s which is 4 times as much as USB 3.0 is offering and twice as much as the regular Thunderbolt. The new controller is codenamed "Falcon Ridge" and allows simultaneous data transfer across two channels per port. This flagship motherboard beside the support for 4th generation of Intel's processor, allows 4-way SLI and Crossfire grahics configuration. Those in demand for 4K resolution are not left out, since the Thunderbolt 2 technology incorporates DisplayPort 1.2, providing sufficient bandwidth to simultaneously transfer 4K video content of up to 20fps while also streaming the content to a 4K display. High quality and extremely durable components will allow record breaking performances under cool and efficient operation. The overclocking features are a must on this kind of motherboard, so together with UEFI DualBIOS comes Gigabyte's EasyTune, which will allow even the newest users to get some additional ticks from their components. Beside the mentioned features, there are also ones like Gaming Headphone Amplifier, Gigabyte On/Off Charge 2 (allows fast AC charging over USB on mobile devices, even when the PC is turned off), High ESD Protection for USB and LAN and a 15µ Gold Plated CPU Socket to ensure long processor lifetime.